When it comes to buying Bourbon, the brand Maker’s Mark stands a classapart. Known for its finest blends and handmade excellence, the name is widelypopular among influential cigar smokers across the world. Makers Mark Bourbon 538 Cigarsare made from long leaf tobacco grownin the Dominican Republic from Cuban seed. Each of these cigars is hand crafted to ensure balanced flavor andsmooth smoke. 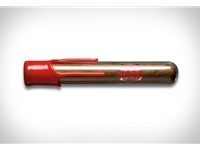 These cigars are sealed in a glass tube to conserve the flavor.BuyDiscountCigars.com provides discounted rates cigars.